Digital student card Frank that introduced fees, will not be offered as JAMKO membership card starting Spring 2019. The new Pivo student card is available to be activated from Feb 28th 2019, not from Jan 1st as previously notified. The membership card by Frank will work normally until this. Frank is a service that gathers the student discounts and other benefits in Finland under one roof. It is owned by national student organizations SAKKI, SAMOK, SLL, SYL and in addition KILROY. With the application you find the hundreds of benefits near you, wherever you are traveling in Finland just by showing your digital student card. Digital student card is not a single service you can obtain. At the moment it is an addition to the JAMKO membership and membership card. JAMKO’s members cannot get only the Frank-digital card, nor Frank payment- or ISIC-multifunction card. Continuing students’ e-cards will function until the end of July, but the membership and the physical card will be valid until the end of September. After that membership must be renewed to maintain student benefits. The Digital card can be reactivated, after student has renewed the membership. New students can join JAMKO and order a physical student card via JAMKO website starting from June 1st. The card can’t be collected until the office opens on Aug 8th. Frank’s digital student card will function at the beginning of August after the register is updated. You have to fullfill the conditions that are needed to become a member of JAMKO. Basically this means that you have to be studying for a degree, attending the current semester at JAMK UAS. You have to become JAMKOs member, order a JAMKOs physical membership card and pay the current membership fee. If you already have JAMKOs membership card, you have to continue your membership for the current academic term or year or paying the membership fee and getting the membership sticker. 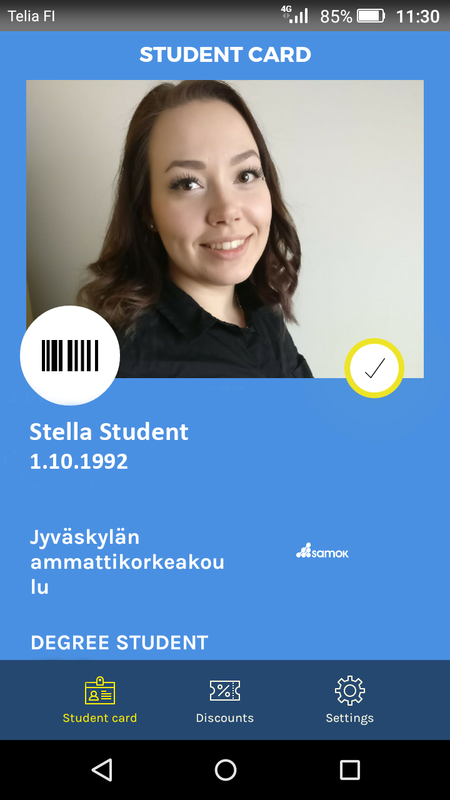 PLEASE NOTE in order to get the digital student card to work, you have to have a Finnish personal identity code and it has to be added to the JAMK system. Consult JAMK international services or read more. The process can take a while, and it is likely, that you get the physical JAMKO membership card sooner than the digital card. After this you can download the FRANK App for Android or Apple devices on the app store. Application is not available for other operating systems like Windows phone. Note that the app is subjected to a charge. Follow the instructions given the application. Frank has listed the frequently asked questions on its website in order to help the process. When your digital card is valid and activated, the yellow circle below your picture pulsates. You can load the app for one device only. Your Finnish social identity number must be in JAMK UAS’ information system. For the digital Card there is also ISIC-feature available, that can help you to prove your student status all over the world and help you to get discounts in over 130 countries. ISIC – licence is a chargeable feature, that can be activated if wanted on your digital student card settings. Choose “buy ISIC-licence” – if the link won´t open, try again by closing the Frank app and opening it again. Go back to Frank app – you will see your ISIC-number on your student card view by pressing the barcode-icon.